LAS VEGAS, NV — TrackR demonstrated new members of their product family at this week’s CES Unveiled 2016 event. TrackR bravo is an updated tracking device, and TrackR atlas expands your TrackR range, and allows tracking of even non-TrackR devices. TrackR bravo improves upon the original TrackR sticker product. Combined with the TrackR app, TrackR bravo provides the same item ringer (ring the device from the app) phone finder (ring your phone by pressing the device button) and separation alert features, but the TrackR bravo sports a thinner design, and comes with a metal, rather than plastic, enclosure. 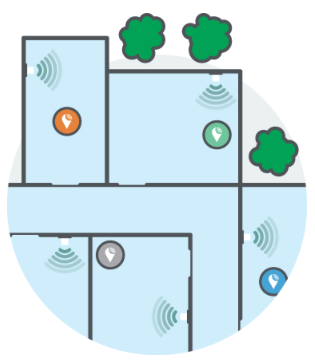 Tracks atlas extends the range of your TrackR network throughout your house or other building. Plug the TrackR device into a wall outlet, give it a name, and even place it on a map. TrackR atlas can provide item monitoring with push notifications when an item enters or leaves a room. You can use voice commands to quickly locate a tagged item. TrackR atlas also works with other major tag platforms, including Tile, XY, and Pebblebee. TrackeR bravo is available now with variable pricing starting at US$29.99 for 1 unit. TrackR atlas is available for pre-order, with pricing starting at US$39.00 for 1 unit.